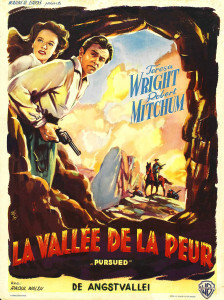 Robert Mitchum had kind of a sub-specialty in westerns about adventurers south of the the border (The Wonderful Country, The Wrath of God, Villa Rides! ), of which this is the earliest. 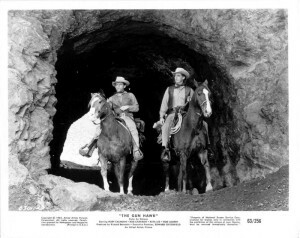 It is set in the revolution of 1916, when Black Jack Pershing and the American army were unsuccessfully pursuing Pancho Villa around northern Mexico in preparation for World War I. Villa was not the only warlord in northern Mexico fighting the regular army at the time, as we all know from The Wild Bunch. 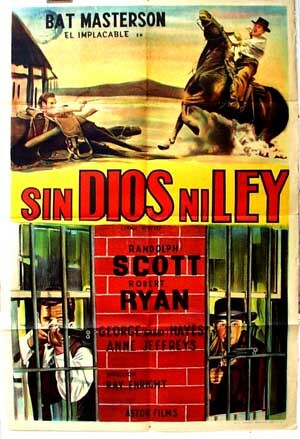 As this movie opens, an American arms dealer named Kennedy (Zachary Scott) is selling guns to the regulares, as they are known, using his wife Lisa (Ursula Theiss) to charm Mexican officials and high-ranking officers. As Kennedy puts together a deal with them, some of their marital discord is witnessed by American opportunist Wilson (Robert Mitchum), who wants to highjack Kennedy’s arms and re-direct them to one of the under-supplied warlords, Col. José Escobar (Gilbert Roland). Heading south from the border to where a battle between Escobar’s partisans and the regulares is taking place, Wilson intervenes with a few well-placed grenades, and Escobar wins. 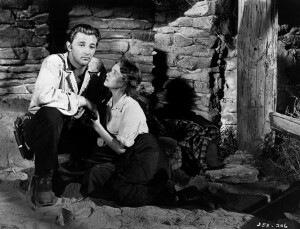 Opportunist Wilson (Robert Mitchum) adds a few granades to the battle below. With Wilson’s help, Escobar captures the train carrying Kennedy and his wife. Kennedy sets up a trap for Escobar in a fishing village with his intermediary Gunther (Henry Brandon). Instead of Kennedy leading them there, Wilson takes Kennedy’s wife and develops a relationship there. When the trap is discovered, Wilson escapes and Lisa is captured. Wilson now persuades Kennedy to tell him where the arms really are, on two barges in another village. Wilson and Kennedy escape Escobar’s men, but Kennedy takes a bullet in the back. A sympathetic priest removes the bullet, and Lisa shows up, with the army not far behind. As Kennedy takes aim at Wilson with Lisa’s purse pistol, he is shot by Escobar, and Escobar and Wilson go to see whether Kennedy was finally telling the truth. They find the two barges, one with gasoline and dynamite (we can guess what will happen with that one), and the other with arms and ammunition. But the army and Gunther are not far behind them, and there is a standoff. As Escobar’s men arrive, they are about to be trapped, until Wilson and Escobar blow up the first barge to destroy the army’s position. In the end, Escobar gets the arms and ammunition to continue his fight, and Wilson heads back to the U.S. border to look for Lisa. Escobar’s partisans and Wilson pursue the train carrying the Kennedys. Silent screen star Gilbert Roland (Three Violent People, Cheyenne Autumn) makes a smoother and more elegant Mexican revolutionary than we usually see. He is probably the best thing about the movie. His relationship with Wilson evolves into a kind of Humphrey Bogart-Claude Rains friendship, as in Casablanca. 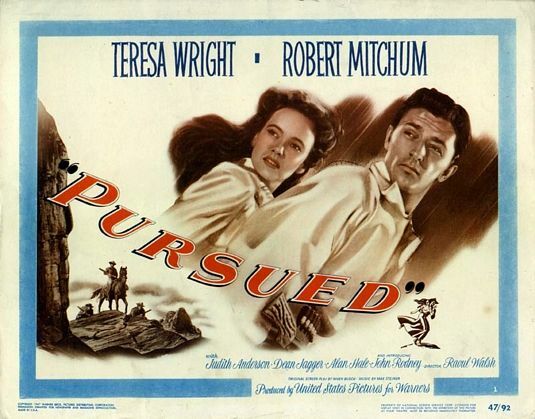 Robert Mitchum’s voice is excellent, and his performance in this convoluted plot is fine. Zachary Scott is good as the ill-fated gun dealer. German-born Ursula Thiess was beautiful, but this was her last movie after marrying Robert Taylor and largely retiring from the movies. 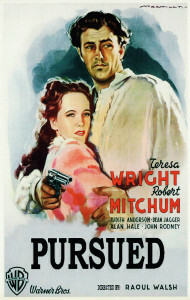 There is little on-screen chemistry between her and Mitchum. 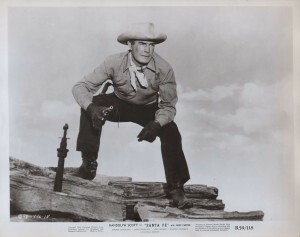 German-born Henry Brandon was no stranger to westerns, having played both Germans in Mexico (Vera Cruz and here) and Indian chiefs (The Searchers, Two Rode Together, War Arrow). 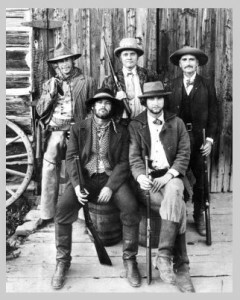 Director Richard Fleischer did not make many westerns, although he made the revisionist The Spikes Gang. However, he was a mainline director, known for Dr. Dolittle, Tora! Tora! Tora!, Fantastic Voyage, Soylent Green and a couple of Conan movies, among many others. The film was shot on location at several of the battle sites of the 1916 revolution, using as extras both old-timers who had fought for Villa and former army soldiers who had fought against them. 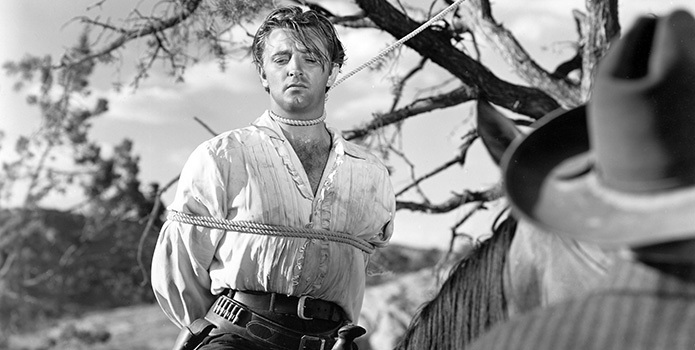 It marked Robert Mitchum’s first producing effort. Music is by Max Steiner. In color, and at 92 minutes it is reasonably enjoyable but not particularly memorable. Most of it is spent in trying to figure out where Wilson’s loyalties lie, other than to himself. Turns out he goes for Escobar’s cause and love, not making any money for himself. 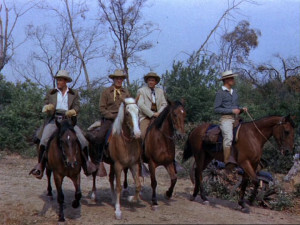 Wilson (Robert Mitchum) and Escobar (Gilbert Roland) hold off the regulares. The title seems like maybe it once had an exclamation point after it (not usually a good sign, and some posters show the exclamation point), and it is not clear who the bandido of the title is. 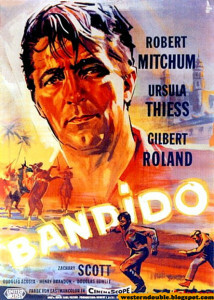 There are lots of bandidos in this movie. It does not appear to be available on DVD. Not to be confused with Bandidas (2006), starring Salma Hayek and Penelope Cruz. 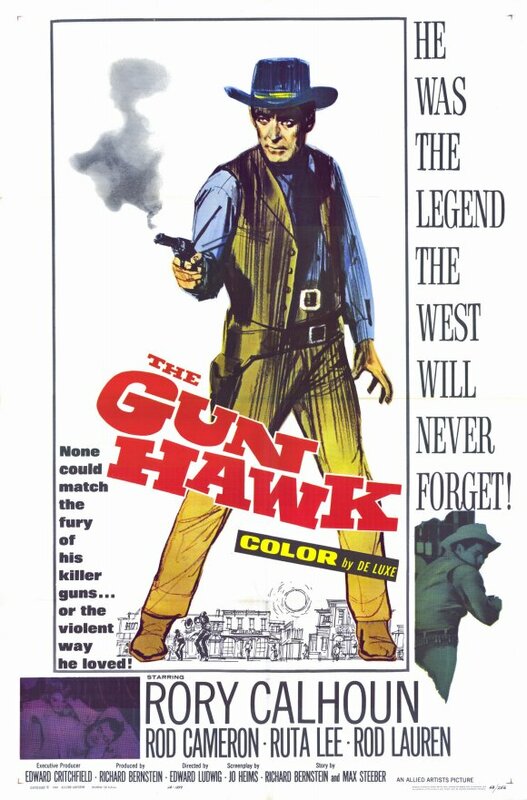 For other westerns set in Mexico during this revolutionary period, see Wings of the Hawk, They Came to Cordura, The Professionals, The Wild Bunch, The Old Gringo, or any of the westerns featuring Pancho Villa as a character (e.g., Villa Rides! 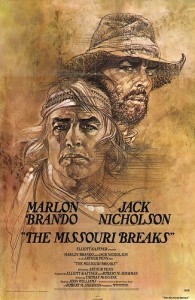 with Yul Brynner, Charles Bronson and Robert Mitchum). This entry was posted in Westerns Worth Watching and tagged Adventures in Mexico, Robert Mitchum on June 29, 2015 by Nicholas Chennault. One of the most common traditional themes of the western genre is having disputes and confrontations finally resolved in a shootout. Typically the good guy (or the forces of righteousness, however they are represented) wins with a combination of skill with a gun (the most common), guile, personal courage and moral force against great odds on the other side. 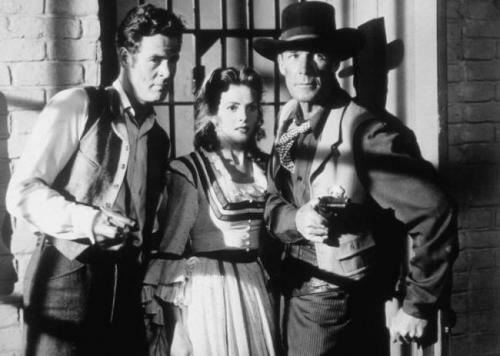 Mostly it works; sometimes it doesn’t (see, for example, Colorado Territory , with the fate of Joel McCrea and Virginia Mayo, The Gunfighter  with Gregory Peck, Devil’s Doorway  with Robert Taylor or Hombre , with Paul Newman). However, one of the ideas that became current in westerns beginning in the mid-1950s was that of the crippled gunman. How far can courage, guile and moral force take you in situations involving violence and requiring unusual physical skill, when the physical part isn’t at full strength? 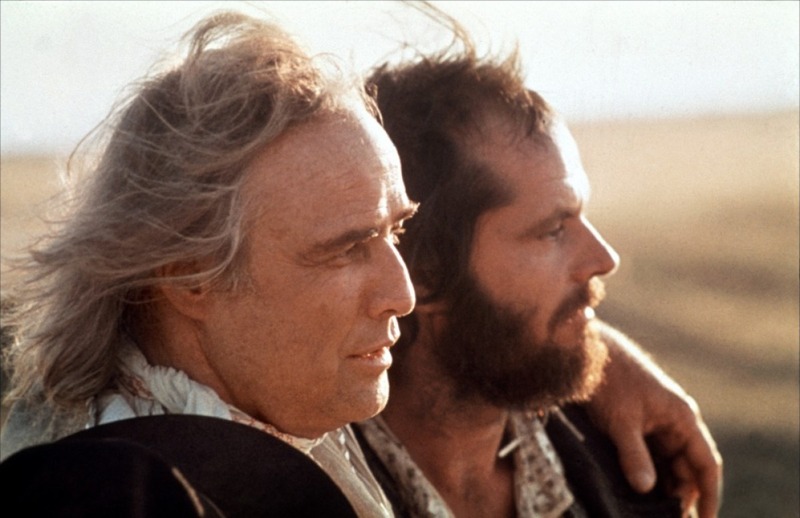 Even some of the greatest directors of westerns used this idea (Sam Peckinpah in The Deadly Companions; Budd Boetticher in Decision at Sundown and also in Seven Men From Now; Howard Hawks in El Dorado). 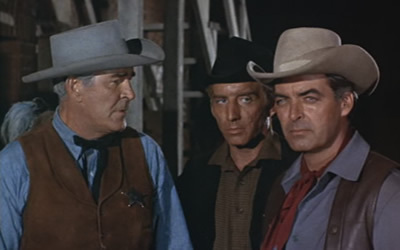 Usually, the impaired gunman goes on to demonstrate that “some things a man can’t ride around,” (see that line in Hondo, Seven Men From Now, The Tall T, Ride Lonesome and others), even if the fight isn’t fair any more—even if it appears hopeless. This often gives a woman the opportunity to provide him with an out on the eve of his trial. She tries to persuade him to go away with her instead of facing his adversaries, testing his moral worthiness and resolution. (See Angela Lansbury in A Lawless Street, Katy Jurado in Man from Del Rio, Virginia Mayo in The Proud Ones, Dorothy Malone in Warlock, and many others). Even Grace Kelly couldn’t make that work in High Noon. 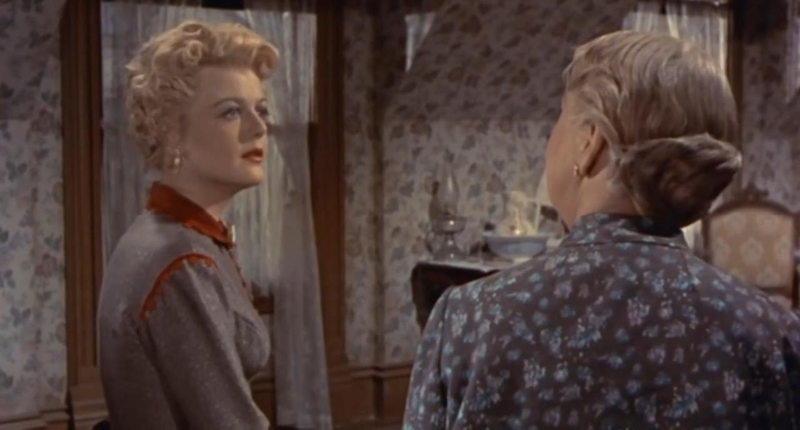 Randolph Scott’s boarding house landlady explains the basics of what a man’s gotta do to his estranged wife Angela Lansbury in A Lawless Street. Ramrod (Joel McCrea, 1947). 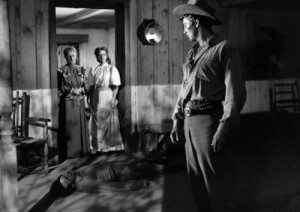 The ramrod of the title is Dave Nash (Joel McCrea), good with a gun but badly wounded in the shoulder before his big showdown with cattle baron Frank Ivey. Solution: he takes a shotgun to the showdown. Gunsmoke (Audie Murphy, 1953). Gunman Reb Kittredge (Audie Murphy) wins a ranch on the turn of a card, but immediately has to get his cattle to a buyer. After the bad guys smash up his gun hand and arm, he must also deal with his enemies. The Far Country (James Stewart, 1954). 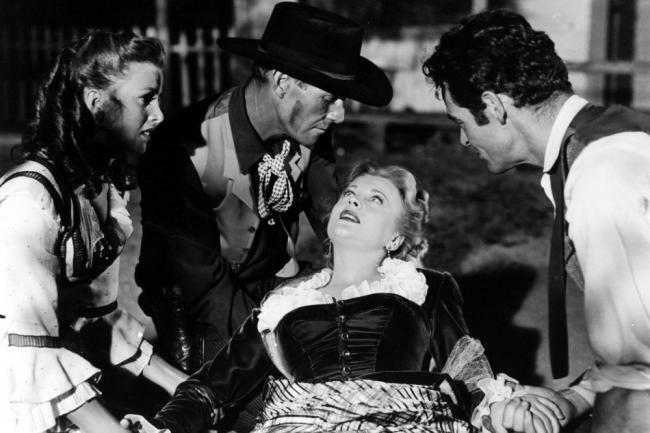 The protagonists in westerns directed by Anthony Mann frequently had psychological impairments. 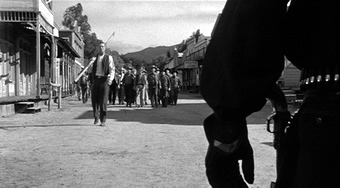 In this one, James Stewart has a physical one as well; his gun arm’s in a sling as he approaches his final confrontation with John McIntire and his band of thugs (including Robert Wilke and Jack Elam). 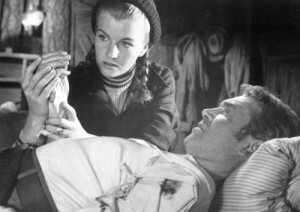 Corinne Calvet nurses the badly-wounded James Stewart back to health in The Far Country. A Lawless Street (Randolph Scott, 1955). Randolph Scott plays marshal Calem Ware, who goes up against his gunfighting nemesis (Michael Pate) with a smashed gun hand and a head injury. HIs only advantage is that the bad guys think he’s already dead because of those wounds. Director Joseph H. Lewis seemed to like to play with the idea of an impaired gunman (this and Terror in a Texas Town). The Lonesome Trail (John Agar, 1955). 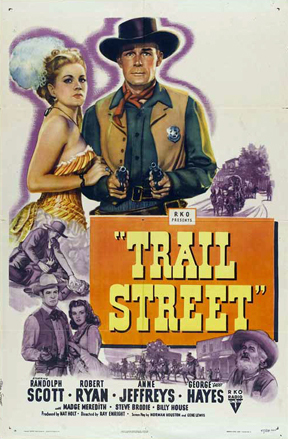 Cowboy and Civil War veteran Johnny Rush (John Agar) returns to find his father dead, his land gone and his girl engaged to the local land baron. 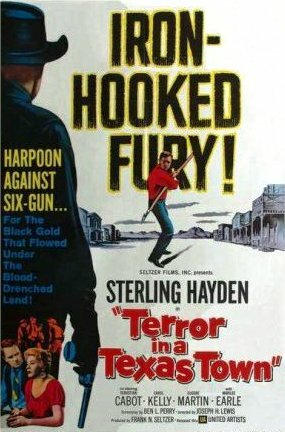 He loses the use of his gun arm in a fight with the henchman of the land baron, so he takes up the bow and arrow instead of the usual tools of violence. 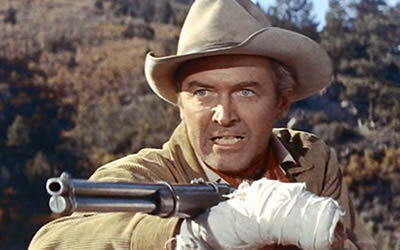 Having had his gun hand shot by bad guys, James Stewart is forced to use a rifle in The Man From Laramie. 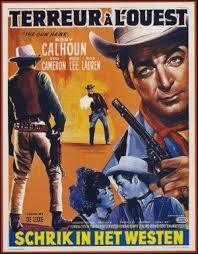 The Man From Laramie (James Stewart, 1955). Will Lockhart (James Stewart) has been shot in the right hand point-blank, but he doesn’t let that stop him in his quest to hunt down whoever killed his brother and is responsible for selling guns to the Indians. It does mean he has to use a rifle instead of a pistol, however. Man From Del Rio (Anthony Quinn, 1956). Anthony Quinn’s Dave Robles has practiced for five years to become very good with a gun, and he is. However, in a fight before his final two confrontations, he has smashed the wrist in his gun hand. Now he walks into a final showdown in that condition. 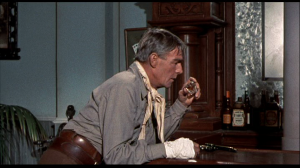 Randolph Scott props himself up using a rifle as a cane, against Lee Marvin in Seven Men From Now. Seven Men From Now (Randolph Scott, 1956). 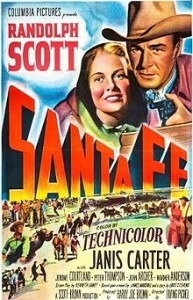 Former Sheriff Ben Stride (Randolph Scott) is disadvantaged in his final series of confrontations with miscreants because he can’t walk. His leg was injured when one of them shot down his horse, and he can only stand using his rifle as a cane. The Proud Ones (Robert Ryan, 1956). Aging city marshal Cass Silver (Robert Ryan) may be proud, but he’s also very good with a gun and very experienced at taming wild towns. However, a bullet creases his skull early in the film, leaving him with impaired vision before his battle with the much larger forces of bad guy Robert Middleton, supported only by his uncertain (but also proud) deputy Thad Anderson (Jeffrey Hunter). 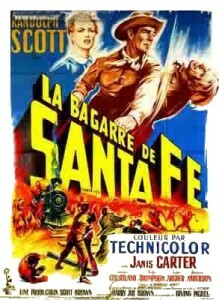 Randolph Scott faces a final shoot-out with a badly wounded hand in Decision at Sundown. 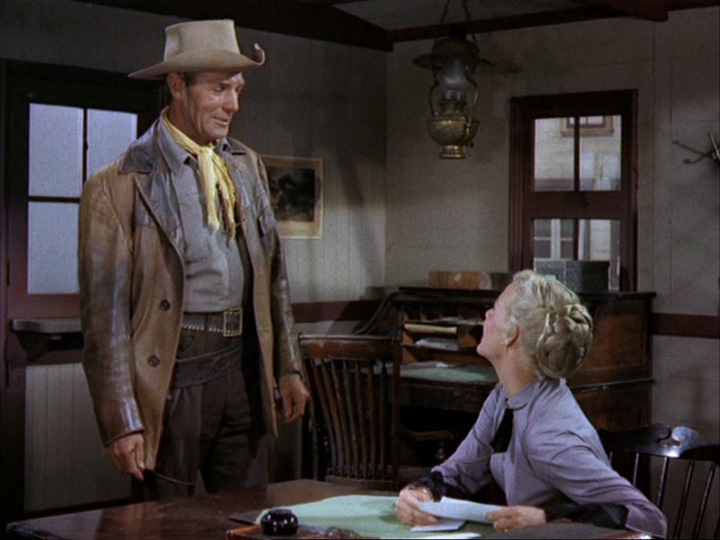 Decision at Sundown (Randolph Scott, 1957). Seeking revenge for the seduction and subsequent suicide of his wife while he was away at the Civil War, Bart Allison (Randolph Scott again) fights the entire town of Sundown, led by its corrupt sheriff (Andrew Duggan) and head bad guy and seducer Tate Kimbrough (John Carroll). 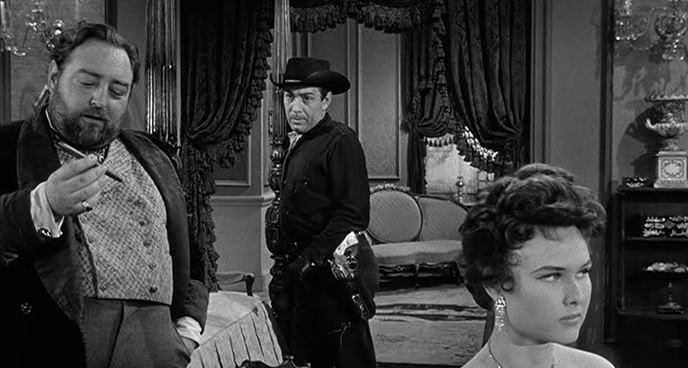 The otherwise capable Allison’s gun hand is injured before his final shoot-out with Kimbrough. Forty Guns (Hank Worden, 1957). Hank Worden’s city marshal isn’t much of a gunman (or even a main character), but he is all but blind when he is gunned down by Barbara Stanwyck’s no-good younger brother Brockie (John Ericson). In this case, picking on an old blind marshal early in the movie is indicative of Brockie’s moral bankruptcy, like shooting a dog or kicking a child. Terror in a Texas Town (Nedrick Young, 1958). This is the rare situation where the bad guy, black-clad Johnny Cale (Nedrick Young), has lost his right hand, although he is still good with his left. 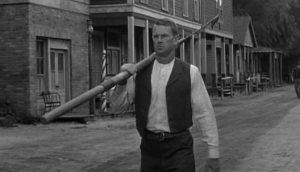 The loss of a hand seems emblematic of his psychological deformities, but he doesn’t seem to feel the loss of it in his role as gunslinging enforcer—until he comes up against a whaler (Sterling Hayden) with a harpoon. 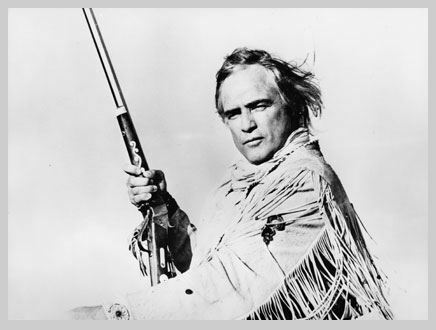 Richard Widmark has been beaten and stabbed in the gun hand but still has to go against Henry Fonda in Warlock. Warlock (Richard Widmark, 1959). Brave but overmatched Deputy Sheriff Johnny Gannon’s gun hand is heavily bandaged, having been brutally pinned to a table with a knife by his former boss. 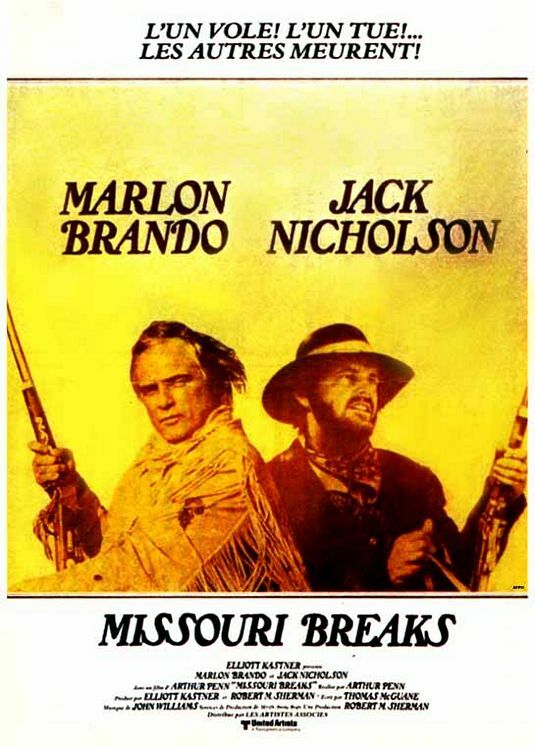 Gannon (Richard Widmark) must now face both that boss and his men in the street, followed by an even greater challenge: going against Marshal Clay Blaisdell (Henry Fonda), who was obviously much better with a gun even before Gannon’s injuries. Brian Keith’s shooting arm doesn’t work right in The Deadly Companions. The Deadly Companions (Brian Keith, 1961). 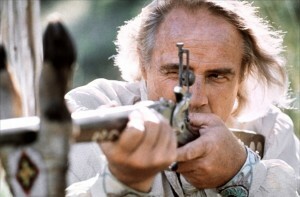 In director Sam Peckinpah’s first movie, Yellowleg (Brian Keith) has a rifle ball near his collarbone from the Civil War, and it often impairs the functioning of his right arm. 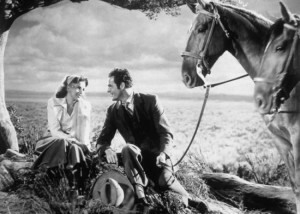 At the start of the movie, it causes him to accidentally shoot saloon girl Maureen O’Hara’s son, and you know it will come up again in a critical situation. The Gun Hawk (Rory Calhoun, 1963). 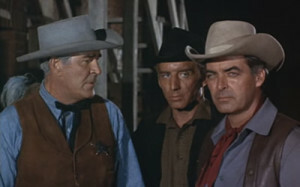 Blaine Madden (Rory Calhoun) goes up against the conscienceless gunman Johnny Flanders (Robert J. Wilke) even though his gun hand is all but useless because of a bad wound to that arm. Not entirely convincingly, he does it by beating him in a fist fight. Ultimately, however, Madden does not win his bigger fight. 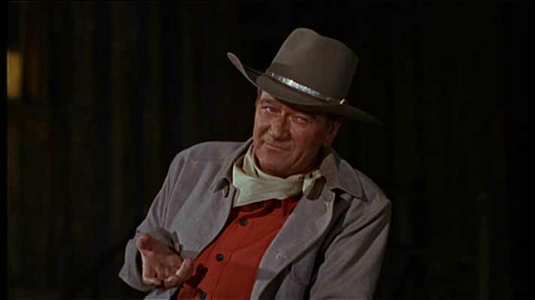 John Wayne’s gun arm goes numb because of an old bullet near his spine in El Dorado. 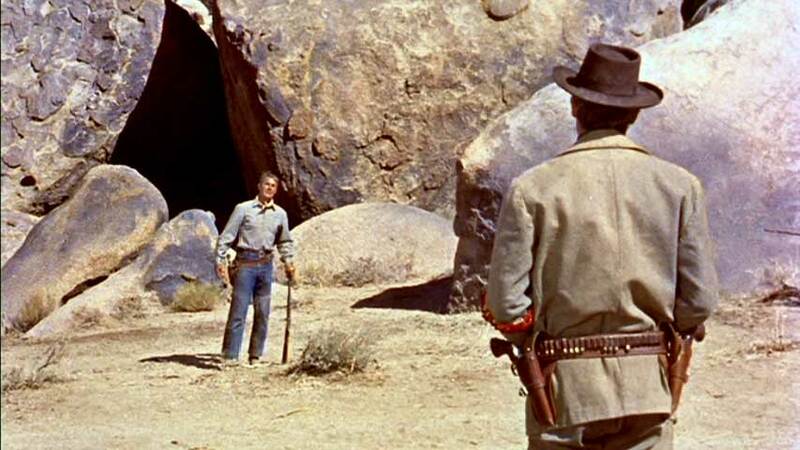 El Dorado (John Wayne, 1966). Expert gunman Cole Thornton (John Wayne) has his gun arm occasionally go numb, due to a wound in his back near the spine. You know this will happen at a critical time. 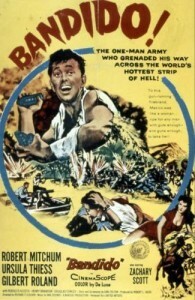 Arizona Bushwhackers (Howard Keel, John Ireland, 1968). This laughably bad A.C. Lyles production features the only saloon brawl on film between two one-armed battlers. 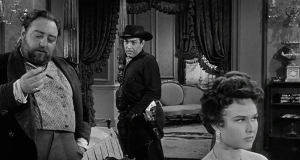 One is a wounded sheriff (Howard Keel) and the other is his deputy crippled in the Civil War (John Ireland). 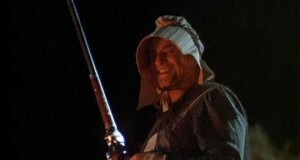 The Shootist (John Wayne, 1976). 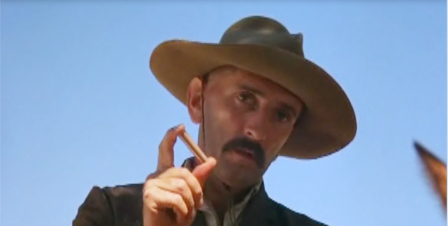 Aging gunman J.B. Books (John Wayne) is dying of cancer in turn-of-the-century Carson City. He arranges to go out on his birthday, in a shoot-out with three of the area’s deadliest gunmen at once. This entry was posted in Lists on June 18, 2015 by Nicholas Chennault.